Waiting on a stubborn NDA to lapse to be able to show my updated reel. In the meantime, here's a rendered version of that Gatekey test I did a few weeks back to test out Morphy and add some lip sync to the reel. This here is a Morphy version of a friend of mine who's been on me to make him one for a long time. Kung Fu Panda 2 was fantastic, Cars 2 hit a nail on the road somewhere to completion. Netflix is my new friend. My wife and I have been enjoying the BBC "what if he lived today" Sherlock miniseries with the British The Offices' Jim character playing a solid Dr. Watson. 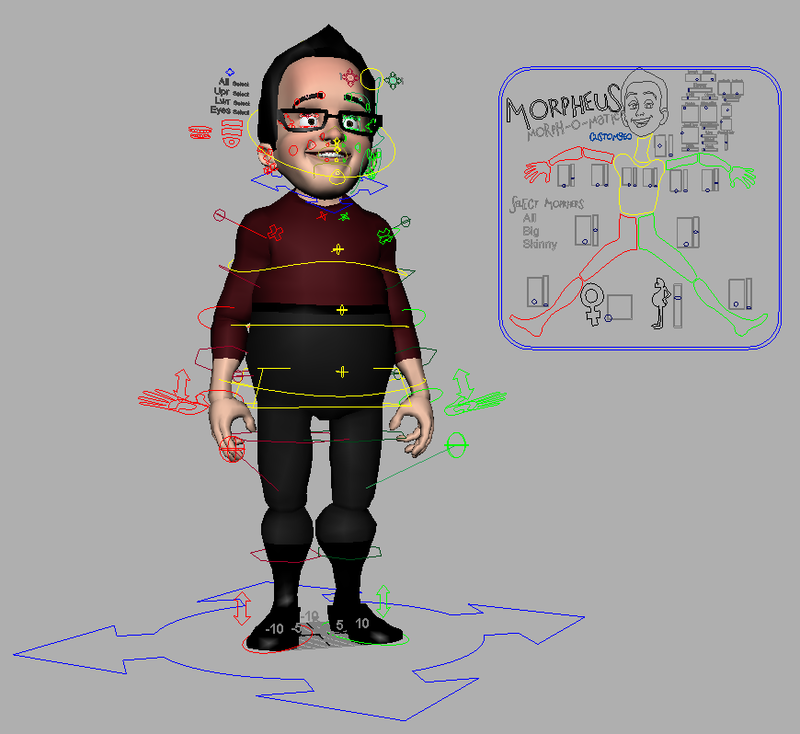 Just wrapped a facial animation gig for the company a good friend of mine works at. Animating on the joints FTW! One of my closest pals was here for a visit a couple weeks back and we brainstormed projects to take us at least till the end of civilization in 2012. I sure hope we finish before then so other folks can enjoy the stuff for a little while. Some pretty cool stuff, we can't wait to start connecting the cg community to it. Digging back into Python for the rigger. Started squashing some Morpheus bugs. Team Fortress 2 has had a lot of updates since I stopped playing last summer which I've been digging through. The Castle keep map with melee weapons only is a ball. Semih sent me an image from a couple characters from his film. This is certainly one of the "fishier" uses of Morpheus I've seen. If you can't tell, the fish's face is a modified Morphy head. Really nice work. Nice one I came across in the 11 sec club wip forum. Playful little piece with a little girl. This is a playblast version of my 'let's-try-out-Morphy' anim test. Had a lot of fun doin the segment and learned a good bit about the rig. Those interested can see progressive updates on my Vimeo channel. For some training wheels on customizing Morphy, you can download the customizations from my animation in their own respective scene files. Eventually I hope to have a more elegant customization saving solution but that day has not yet come. Base scene file with my lighting setup from this piece since some folks haven't the time or inclination to set up lighting. Some just wanna animate and I can appreciate that. REMEMBER - mental ray. BEFORE you try pulling one into a scene, make sure your preferences are set to cm units. Otherwise the rig will self destruct. Import whichever rig you want WITH 'preserve references' checked.